Elegant design, style, innovation and quality are the essence of every Baumatic product including Baumatic wine coolers. Made in the United Kingdom these wine storage units are recommended for wine lovers living in the UK or in other European countries. The company is known for its wide range of products that include refrigeration, laundry, extraction and dishwashing, in addition to kitchen electrical appliances. Especially unique are their wine storage units which are great for keeping wine at perfect serving temperature. Baumatic presents the best way to extend your wine’s life, maintaining constant temperature, humidity, and excellent air circulation without any vibration. It is the most capacious model with dimensions of 870mm x 595mm x 578mm (H x W x D) and a gross capacity of 171 liters, which means, it can hold up to 44 bottles. It slots in 6 wavy chromed shelves that includes 4 adjustable shelves and 2 fixed shelves, ideal for storing different sizes of wine as well as champagne bottles. Featuring two individual temperature zones, you can set temperature between 4 to 16°C, which is perfect for storing red and white wine. BFW440 offers an elegant look with blue tinted door glass and stainless steel doorframe, which perfectly complements the black interior and exterior. 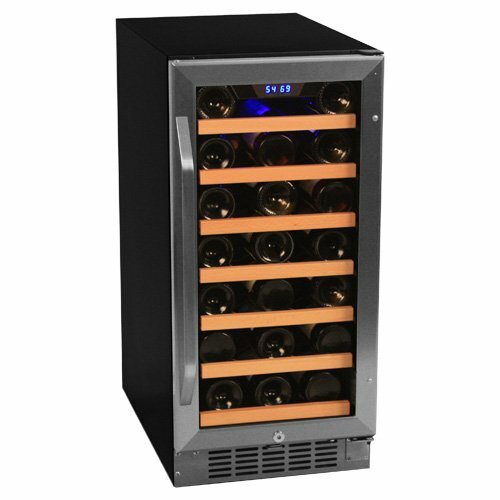 Other features of the BFW440 include the basic features of other Baumatic wine cooler models. Wine coolers with two temperature zones. With the dimensions of 840mm x 500mm x 587mm (H x W x D), this model can perfectly manage up to 40 bottles of wine (gross capacity of 150 liters). It features 6 waved chromed wire shelves and 1 chromed rack. This is a nice unit with tempered glass door, which is reversible and displays an aluminum-look doorframe. It also has adjustable legs, which allow it to be easily fit in anywhere. The interior and exterior of the cabinet are black. It is equipped with interior light and indicator light that can be switched on/off any time. Temperature range is between 7°C to 18°C. Digital temperature regulation allows you to increase or decrease the temperature by 1°C. A LED display lends an elegant look to the unit. The system also features built-in sensors, anti-vibration device, and auto cycle defrost. Above all the unit is free from vibrations providing undisturbed storage condition for your wines. The low energy consumption (0.86 kW/24 h) is another benefit. The BW28 can accommodate up to 28 x 1 liter wine bottles on 6 wavy chromed shelves. It uses thermal electric cooling instead of compressor technology, ensuring higher efficiency and lower operating costs. Dimensions of the wine refrigerator measure 730mm x 460mm x 540mm (H x W x D); it is small enough to be placed in your kitchen. Furnished with tempered door glass, it has an appealing design and elegant look with aluminum-look doorframe accompanying black interior and exterior. It includes a unique drain hose and auto-evaporated water tray to help maintain proper humidity level inside the cabinet. The Baumatic With the adjustable thermostat you can attain optimum temperature between 10°C to 18°C. The adjustable legs allow the convenience of placing the wine cooler in an appropriate place. With the interior lights, the model just looks great. BW28’s operation is fan assisted, however vibration free, and creates no noise because cold temperature is created without a compressor by using the unique thermoelectric cooling technology. Additionally, the auto cycle defrost feature prevents development of ice blocks inside the unit. 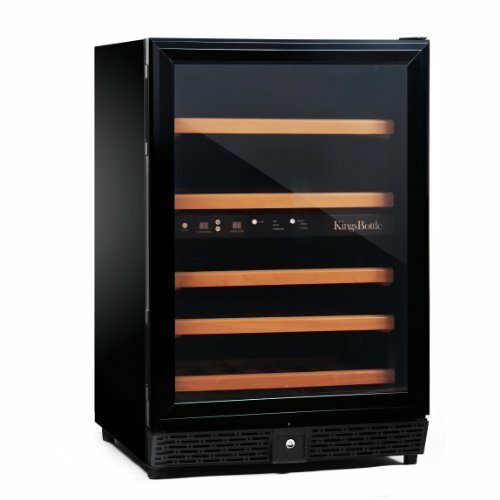 TIP: the EdgeStar 28-bottle Wood Wine Refrigerator is a similar unit; the wood-paneled model looks especially great. 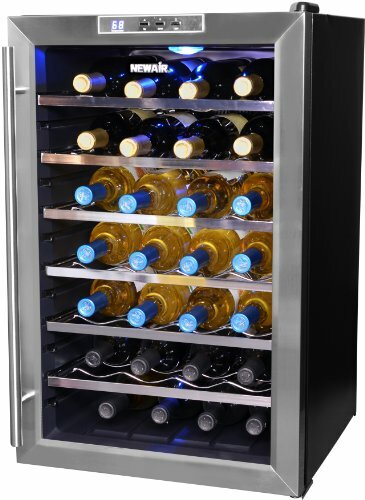 If you have space crunch for placing your wine cooler, Baumatic presents the 60 liters BW18 wine refrigerator with 5 waved chrome-plated wire shelves perfect for managing 18 bottles. This cooler has dimensions of 645mm x 355mm x 500mm (HWD). It simply looks great with aluminum look door trim and black body. 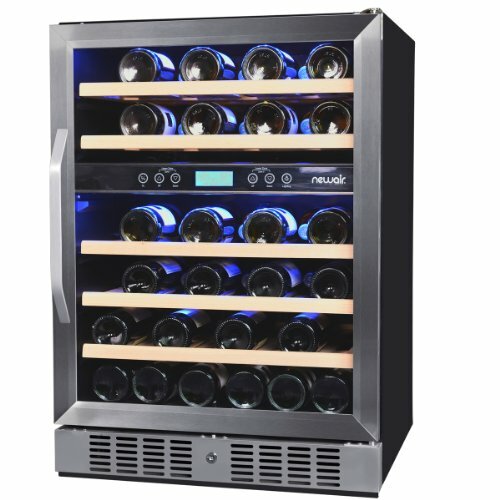 This particular unit will keep your wine at optimum temperature between 10°C-18°C. Most of its other features are same as that of the other models’ mentioned above. 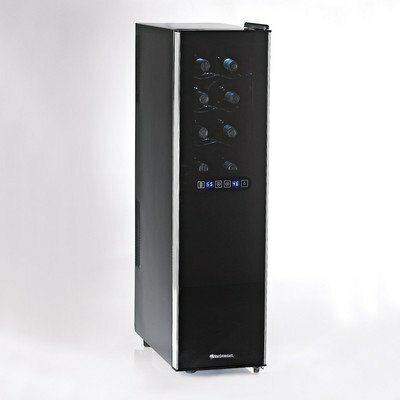 Take a look at Review of the Haier 18 Bottle Thermolelectric Wine Cooler. 16-bottle wine cellars have slightly smaller capacity.